The first wave of self-tracking devices—Fitbit, FuelBand, Basis Band—has washed ashore and perhaps receded somewhat. Even so, sports and activity trackers make up some 61% of the wearables market, and market watchers predict more growth. 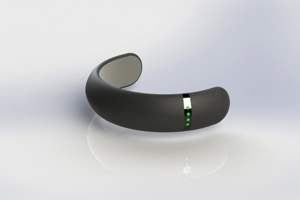 Most of these new health monitors strap to your wrist to record heart rate and activity. But Heapsylon’s Sensoria smart socks are a little different and may provide a clue to which way the wind blows—in the near future, more fitness trackers and health sensors may be embedded in clothing or attached to the skin. Here’s how they work. The company affixes textile sensors to each stocking, fore and aft. These sensors record foot pressure, heart rate, and body temperature and relay the data to a horseshoe-shaped device magnetically attached to the sock’s cuff, snug as Jeordie La Forge’s visor. The socks are more accurate step trackers than the wrist-worn type that rely solely on accelerometers. But even better, if you’re a runner—Heapsylon’s initial target market—the socks’ pressure data are arranged inside a foot diagram in an accompanying app to show your average foot strike.